Get here NDA Mathematics Answer Key 2019 Set D of exam held on 21 Apr 2019. Candidates who got Set D question paper in Maths of UPSC NDA/NA 1 2019 can check its answer key from this page below and download PDF. This NDA answer key contains correct answers of 120 questions asked in Mathematics Set D Question Paper. You can estimate marks out of 300 by using the NDA Maths Set D Answer Key before declaration of result of NDA 2019. NDA Mathematics Answer Key 2019 Set D can be checked given below after exam. Latest: Answer key of NDA 2019 Mathematics Set D, Question Paper, Expected Cut Off, Student Reactions, Analysis are now available. UPSC releases official NDA answer keys a long time after exam. Therefore the answer key of NDA 1 2019 Maths Set D that you get here just after exam is unofficial. However, we put all our efforts in ensuring that you get here correct answers of NDA Mathematics Set D Question Paper. 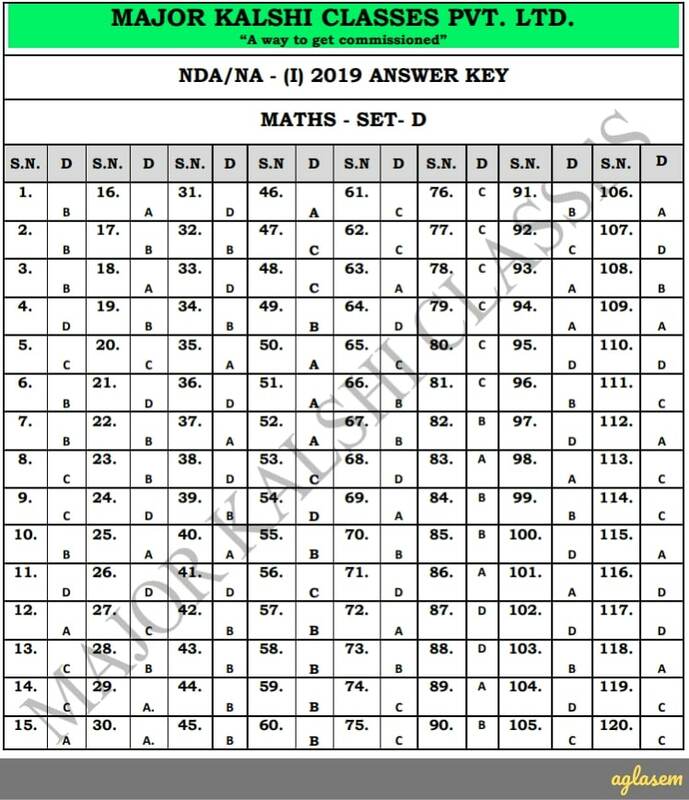 Now that exam has gotten over at 12:30 PM, you can enter correct answers in the real time answer key of NDA 1 2019 Mathematics Set D below. Click here to download answer key of NDA 1 2019 Mathematics Set D PDF. PDF version of the NDA 1 2019 Mathematics Question Paper of Set D is now available here after exam. Click here to download question paper of NDA 1 2019 Mathematics. Or watch the video below. How to calculate marks using NDA Mathematics Answer Key 2019 Set D? Therefore, marks as per answer key of NDA 1 2019 Mathematics Set D = 2.5*Correct answers – 2.5/3 * Incorrect answers. It is a significant document for the candidates who have appeared for the exam as they can match their answers as per it. Also, candidates will get a roundabout of the marks obtained. After giving the exam, the curiosity among the students is at its peak. So, to lower the same answer key is released. The exam conducting body also gets enough time to calculate the marks. With the help of answer key, candidates can analyze their overall performance in the exam. Prior to the releasing of the result, aspirants get to know the estimate of marks. Before using the answer key, candidates should have knowledge of how to use the answer key. Candidates must be aware of the marking scheme of the exam to get the rough idea of the marks. Students will get the idea of marks obtained when he or she will calculate their marks as per the answer key. With the help of answer key, candidates can check the marked responses and correct answers against it. With the help of answer key, candidates get to know that they are eligible to take part in the further process or not. NDA stands for National Defense Academy. The academy conducts the exam twice a year in NDA / NA for the candidates who have always aspired to be in a government Job. The conducting body is UPSC (Union Public Service Commission). Through NDA, candidates get a job in army and defense. Candidates who clear all the admission exams which come under NDA can opt for any of the three prestigious services. That is the reason it is known as the first tri-service academy in the world. To be selected under the defense, candidates need to undergo a written exam followed by the SSB training. Let us know your feedback on NDA Mathematics Answer Key 2019 Set D in comments below. To discuss any question of NDA 1 2019 Mathematics Set D also you can comment below.